I managed to get outside in a brief spell of sunshine over the Easter bank holiday break. I went for a walk in Friston Forest, in Sussex, on April 1 and took the photo at the top of this post. Although I know we have had particularly cold weather so far this year, but I was really surprised to see how few wildflowers were out. There were a few clumps of daffodils, but that was about it. Compare the top picture with the one at the bottom. 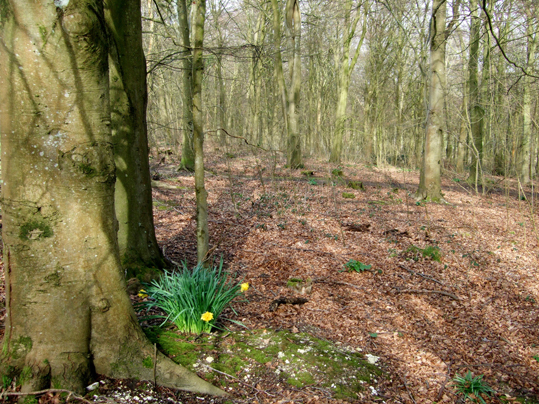 I took the lower photo in Friston Forest in April 2012. 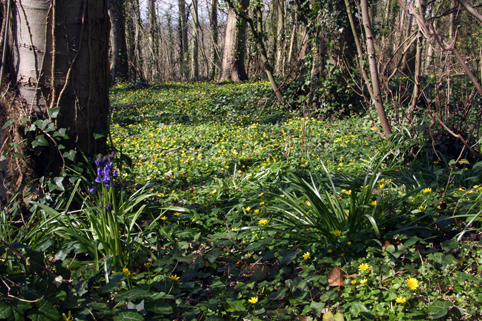 Back then the ground was a carpet of lesser celandine and bluebells were starting to come out. Admittedly that was mid-April - so a couple of weeks later in the season - but I really don't think the wildflowers will have caught up that much in two weeks this year. It is certainly avoiding the cold and rain this year. Let's hope we get more sunshine soon. It shows just how long this Winter has hung around. During the night, much to our displeasure, we encountered four people who were conducting some manner of strange witchcraft ritual, this was extremely loud and was actually quite disturbing to say the least... admittedly our having consumed fairly large quantities of magic mushrooms did somewhat intensify the experience.. however I'm fairly certain, psychedelicso aside. that this experience in the dead of night would have put the winkles up most people. I only ask you this because you seem to be familiar with these Woods, and I'd love to know if you have ever heard of anything like this taking place there ? I've never personally done any rituals in Friston forest late at night. I do know that pagans in general like to celebrate the seasons in outdoor locations. I agree it is not great to make a lot of noise in places where residents might be trying to sleep at the time.